Marian was not only my classmate, she was my cousin, we went on to college together and I have had the pivilege of sharing our families throughout the years. Marian married a wonderful man. Leon Older and they have three beautiful intelligent daughters. Her first grand child was born shortly after her death. I miss her, but I am so happy that we shared so much of our lives together. Robert was one of the nicest guys I knew through school. Interesting that our Senior Opinion poll had him as "the neatest male". I always thought he looked well groomed and neatley dressed. He will always be the "King" of the prom. Rest in peace my friend. I was sent this Obit and wanted to share with all of you Roberts wonderful life. Robert was my best friend for many years. Our kids grew up together taking vacations to the snow, the river and later Robert bought a cabana on La Playita Baja. We spent many fun filled weeks at the cabana with the Alarcon family, swimming, fishing, surfing. May he rest in Gods Arms till we meet again. What a sense of humor.... Yet, serious and humble. Our friendship will always remain in my memory. We knew each other, throughout high school. You were a gentleman and a humorist! Looking at your photograph, now; that is the classmate that I remember! I wanted to add that I, too, attended Pat's funeral. Pat lived on Jackson just "down the street" from me. We both attended Dominguez Elementary, Wilmington Jr. High, and, of course, Banning. At the funeral, I realized, even though I grew up with her, I really didn't know her. I saw her family and many friends and students (she was a teacher) and thet loved her very much. From the time she was a baby her Uncle called her Penquin. For that reason, Pat collected penquins, in any form. They filled her home. Now when I see a penquin, I think of Pat. I always thought the world of Pat, she was so much fun and always seem to be so happy and laughing at everything. When I had heard she had passed I went to her funeral to say goodbye to one of my childhood friends. Charles, so saddened to see your name here. YOU had quite a sense of humor! We were on the B football team and were able to play if "we were winning greatly or losing badly." I recall that we were both disciplined for writing our names on the back of our jersies; probably a first, in 1963. "...we were soldiers once...and young...." For his service in Vietnam, Steve was awarded the Distinguished Flying Cross. I met Steve at WJHS, and that frienship continued through high school. Although Leilani didn't graduate with us at Banning, I know many of you remember her. We received information that she had passed some time ago at age 43 and although some of you may have known I didn't. So, I'm assuming some of our other classmates who remember her may not have known either. I remember her as a really sweet, happy, genuine nice person. Jeanie always had a smile on her face and always showed interest in everyone she talked to. I was saddened to see her name on the list. To a very sweet and thoughtful person, Jeanie Ferguson, you are missed. Although I knew Joe in school, I got to know him better after marrying my childhood friend and neighbor Sharon. Always a gentleman and a beautiful smile. Gone too soon. Another best friend right here. My kids grew up with his and we had great times together. Joe gave me a job later on in life and I will always be grateful. so sad to find Thommi on the memorial page. She and I sat together in several classes and She was so much fun. Rest in peace Thommi. Vernon Gilbert! My, oh, my! We did a lot of cruising in that Chevy hot rod you had! We remaind friends throughout high school, and after graduation. The last time I saw you, you were on a Harley Davidson, on Avalon Blvd., and you had a "great big smile" on your face. It was a sad day when my family had to say goodbye to Ronald. He was a wonderful man, outstanding husband, brother, uncle, and godparent to my boys, Robert and Alex Miladinovich. When Ronald was dating Judy Ralston in the 11th grade he and Judy set me and his cousin Ted up on a blind date (unknown to either of us) at the ice skating rink. Years later when Ted and I married, Ronald was his best man at the wedding and remained a loyal faithful friend until his passing. Ronald and his wife loved to travel. He once took his wife shopping in Hong Kong (I was so jealous) and loved visiting Yugoslavia where he enjoyed learning not only his wife's culture but that of his parents and grandparents. Personality plus!! She would make the sunshine on a gloomy day. It seems that I shared most of my GYM classes from Jr. High through High School with Elana. You could count her support, even if it wasn't your "best game"..
What a glorious person; so full of life! Just seeing and greeting you, on campus, made everyone's day. Somehow, you had the ability to remember your classmate's names. All of us! Your happiness and joy echoed throughout the classrooms, halls and schoolyard. You shall not be forgotten. I recently obtained a copy of The Principal as Professional Development Leader, the highly acclaimed volume by Phylllis Hendry (Lindstrom) and another colleague at San Jose State University, published shortly before her passing. As classmates who are college teachers, we particularly appreciate the contribution she made as a faculty member. I remember a beautiful girl and in my mind's eye she is wearing her tartan and dancing the Scottish saber dance over crossed swords. We were friends from the 10th grad until the day she died. Never once in 47 years did Kathy forget to call me on my birthday. That pretty much says it all. She was so full of life and love. Happiness overflowed from her pores. I never met a more generous or caring spirit and doubt that I ever will. I still miss her terribly and when asked for the name of my best friend, I will always enter "Kathy" in that spot. Rest in peace, my deal friend, until we meet again. "Piffer"
I received this from one of our classmates sometime ago. My memory fails me as to who it was, but I appreciated receiving the "In rememberance" and feel this is just the place to share it with all of her classmates. We were classmates, and would occasionally chat. You were charming, open minded, soft spoken and true to your friends. What a pleasure to have known you. I remember Don ...we had drafting and auto shop together and got away with alot......I remember the summers we would hitch hike to Huntington Beach with Dennis Hattersly and sometimes Mike McCueen ...will never forget those times...funny I now live in H.B. I had looked so forward to chatting with you, once again. To my "diaper derby" buddy. We were newborns when we met and our families shared many, many joys and celebrations. Amen and hallelujah! You were a good friend to Mike Thompson, Richard Díaz and me. outgoing, positive, full of humor and love of life! You still have my vote for "Best smile." What an athlete! You seemed to excell at every sport you played. Also, what a dancer. I recall you teaching us the "mashed potatoe," at Banning Park, just before a school dance. "You did good!" You rest well, and in peace, my friend. I was saddened to see you on this page. I remember you as a cheerful, friendly and kind classmate. In June, 1964, you wrote in my yearbook, "I hope you have the most wonderful life possible, Ralph." 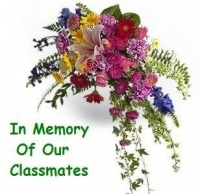 Depending upon how the teachers arranged us, alphabetically, in our classes, I sat to your left, or to your right; in front of you, or behind you.... You were clever, witty, outgoing, soft spoken and friendly. It is a pleasure to have known you. Who did not know you? You were friends to all! If Facebook was available to us in 1964, I do not doubt that the entire Phineas Banning High School student body would have been your "friend." You shall be missed. But, our friendship is still in my memory. Martha was such a beautiful person with a beautiful personality. Will always remember her. Another of our classmates, that by her presence in a group, allowed us to share her positive and joyful attitude...every day! Anyone looking at your yearbook portrait can see that you had a love of life, and made everyone close to you, feel good. I do not recall you ever having a "bad day!" As with my other classmates, it was a pleasure that you crossed my path. I think Billy was the funniest guy I ever met. He could have been a great comedian on tv. God bless him. Say it ain’t so! Mike, my friend throughout high school, and after graduation. You were one of those individuals that truly made a difference in my life. Even as I try to write this, it is a very difficult thing to do. I am extremely saddened that I see you on this page. You realized that after my return from Vietnam, and personal issues, that it was necessary for me to leave the Wilmington area. Of course, over the years, we lost track of each other, but you, and our group of friends, were always on my mind. I feel blessed that we were able to chat at our fiftieth reunion, one last time! Rest in peace, my friend. You shall never be forgotten. I received an email today from Barbara's husband, David Walker. He wanted to say that she had passed away in May 2012. He shared that she was very proud to have graduated from Banning High School and grow up in Wilmington. I remember Barbara as a sweet and shy girl who never had a bad thing to say about anyone. Rest in Peace Barbara.